The classic beauty of hardwood floors has captivated the imaginations of builders and homeowners in North America for literally hundreds of years. George Washington, Thomas Jefferson, Dolly Madison, Abraham Lincoln, Clara Barton, Thomas Edison, Henry Ford, Martin Luther King Jr. and countless other famous figures from the past lived in houses with wood floors. While they sometimes used area rugs and carpets, too, these individuals almost certainly appreciated the remarkable beauty of finely grained, polished wooden floors in their daily lives. Perhaps not surprisingly, even today home buyers frequently display a preference for residential properties equipped with this timeless flooring. 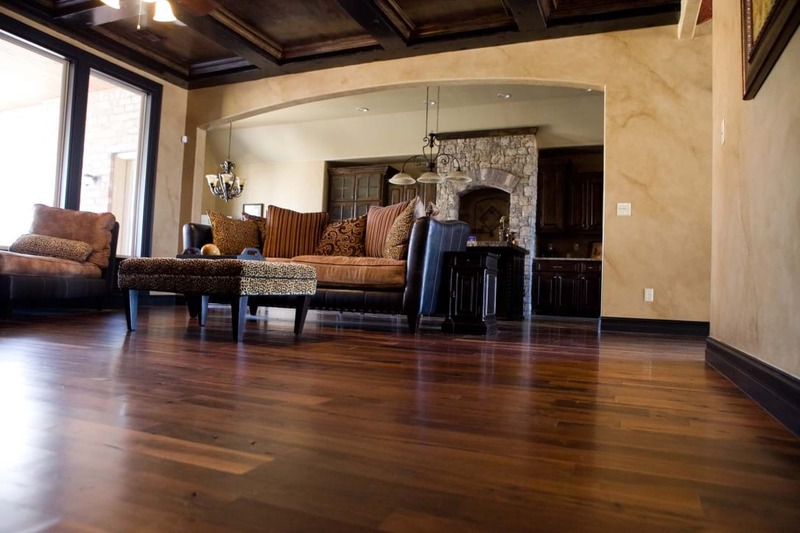 From deep brown hues to glossy umbers, deep cherry reds, and light golden, sandy tones, a variety of different stains and finishes allow craftsmen to tailor wood floors to fit a home’s prevailing architectural design and decor elements. If you’ve ever paused to admire a finely finished hardwood floor, you’ve probably noticed the rich texture of the underlying woods with appreciation. The charm of a polished, shining hardwood floor never goes out of style! Adding this feature to your home enables you to include an in-demand aesthetic improvement. If you expect to list your property for sale at some point in the future, you’ll welcome the ability to advertise “lovely hardwood floors”. In the meantime, your family and friends can enjoy the beauty of your new solid wood flooring. Very strong, durable hardwood floors make daily housekeeping an easier task for some households. Homeowners who install this type of flooring can choose to protect the surface of the floor by adding a semi-permanent layer of water-resistant wax. Alternatively, following the installation company’s guidelines for maintaining unwaxed hardwood floors in good condition won’t typically require extensive daily efforts. Caring for the floor by vacuuming will suffice in many cases, coupled with requesting periodic cleaning and maintenance services from a hardwood floor care expert. The ease of keeping hardwood flooring in an attractive condition has likely contributed to the enduring popularity of this type of surface in residential properties. While beautiful, carpeting does offer some distinct disadvantages compared with harwood flooring. The delicate fibers and weave of a carpet sometimes become a repository for trapped dust particles, pollen, and dander. Pet fur clings to this type of surface. By contrast, hardwood flooring readily enables homeowners to notice and remove unwanted debris. A wooden surface won’t attract lingering odors as readily as fibered carpeting, either. For this reason, some allergy sensitive homeowners prefer uncarpeted hardwood flooring. In this community, the enduing appeal of hardwood inspires homeowners to request the installation of this type of proven flooring in their homes with some frequency. Have you considered making the switch from wall-to-wall carpeting to elegant, easily maintained hardwood? Go ahead and contact us now to explore your installation and maintenance options.